After we finished sketching the laundromat, we moved on to Petco. I can’t wait for longer days so we can do our Tuesday night sketchcrawls outdoors again. 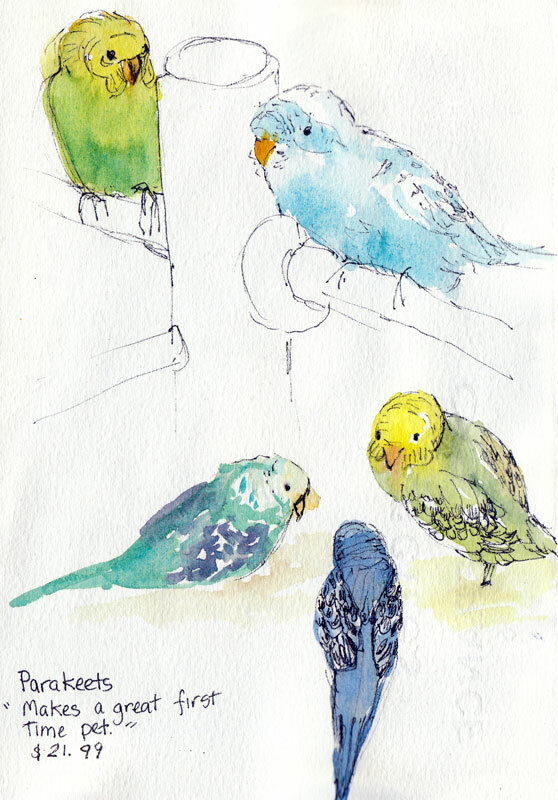 But it was fun drawing the parakeets. They were holding pretty still, puffing up and preparing for beds. I worried about them, hoping they have happy lives. This little guy was kind of cute in a spooky, red-eyed sort of way, but even on sale I wasn’t tempted. 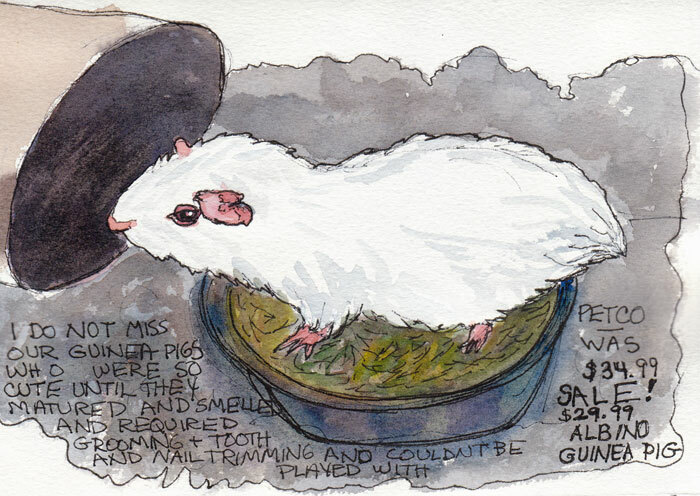 When my sons were young, I bought an adorable pair of long-haired calico guinea pigs and we had such fun playing with them…for about two weeks. And then there was the years of caring for them…. He looked way too much like the kind of rodents you do NOT want to see in your house. I’ve seen pet rats that had some charm, but this guy just looked way too big and ratty. My sister had a rat that I babysat when she went on a trip. The rat was in a cage beside my son’s bed and it pulled the wool blanket that was my Grandma’s from the bed into the cage, bit by bit, and chewed off the corners for nesting material. Then a couple of years ago, when Alison of art blog Scribbles Adagio was creating a multi-media work that included scraps of old blankets, I sent a 12″ square of the blanket to her in Australia. She sent me back one of the finished pieces that now hangs over my bed, a keepsake partly composed of my Grandmother’s blanket. And I still use that old blanket to keep warm and cozy when I watch TV, even though it’s full of holes, missing corners and a 12″ square. Your birds are budgerigars. And their colours suggest they’ve been bred (for many years!) in captivity. I hate birds in cages! But I did have rats, remember? I am with you on the rodent situation. Not a chance! Great sketches too. I always hate going to the pet store for the very reason that you said: it makes me worry about all of those small animals. 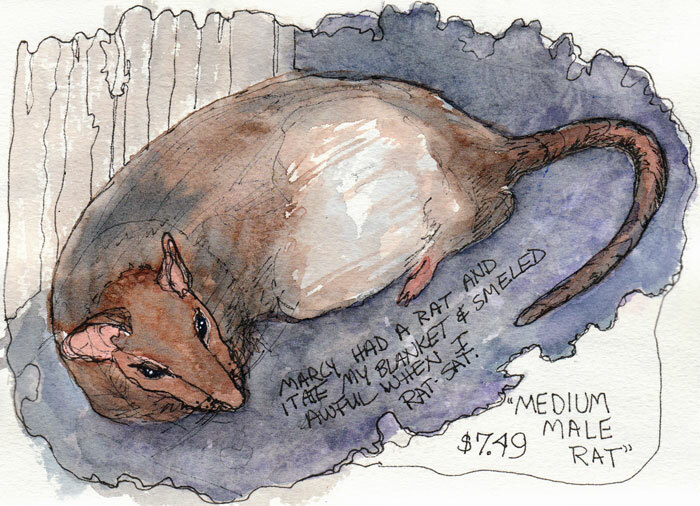 Enjoyed this post very much, from the charming sketches of birds to the rodent stories. Sighing here, since none of my artist friends are sketchers. Your sketching group sounds wonderful. Love those birds—the rat, not so much. It isn’t your sketch, it’s the subject! I don’t understand the attraction of pet rats but I’m sure my knee jerk aversion to them is a big part of the problem! Related to a traumatic experience in the feed room of my grandfather’s barn, no doubt….ugh! These are wonderful sketches, especially the birds. I didn’t know there was such a thing as a pet rat! Eew…rats! I never understood that particular trend! I had a guinea pig for seven years as a kid though. I used to take it to show and tell where it would proceed to pee and poop all over the place! I like the idea of sketching at the pet store and your sketches are wonderful! I wonder how dinahmow could tell they were bred in captivity…? Hi Jana, I just wanted to let you know that I had a very wonderful morning visiting your blog and all the entries that are interesting, entertaining and beautiful. Thanks you. My friend Linda used to have a pet rat called Phipps who went everywhere with her, riding on her shoulder when she was busking in the square. He ate anything and everything, too, like your sister’s blanket-eater, and he eventually died after eating too much uncooked Fimo. When Linda got her own place she moved on to keeping dogs instead – and has never looked back! You are a productive painter! Nice pictures of birds and animals. Do you really think that birds should be in cages? I don’t think so, though people are usually very kind to their pets. Great work.